We are Catholic! We are UNLV Rebels! We are Catholic Rebels! The St. Thomas Aquinas Catholic Newman Community is a ministry of the Roman Catholic Church that is committed to bringing the Gospel of Jesus Christ to the students and faculty of the University of Nevada, Las Vegas and forming future leaders for the good of the Church and society. Our community wishes to build a church for the students and faculty of UNLV. A church will serve as a signal to Catholic students on campus that the Church is there to meet their spiritual needs. It will also be a visible invitation to those who are curious and want to engage in dialogue about the Catholic faith. The St. Thomas Aquinas Catholic Newman Center started as the Catholic Newman Club for the students of Nevada Southern University (the original name of what would become UNLV) in 1960. It was operated out of the old Bishop Gorman High School. In 1975, the club moved to the UNLV campus to its current location at the newly constructed Interfaith Student Center on land owned by the then Catholic Diocese of Reno-Las Vegas. The original purpose of the center was to foster and encourage interactions of different faith traditions present on the UNLV campus. In 2002, the Catholic Newman Club was renamed the St. Thomas Aquinas Catholic Newman Community, in honor of the patron saint of students. By 2006, both the Protestant and Jewish organizations that shared the space with the Newman Community left the Interfaith Student Center. 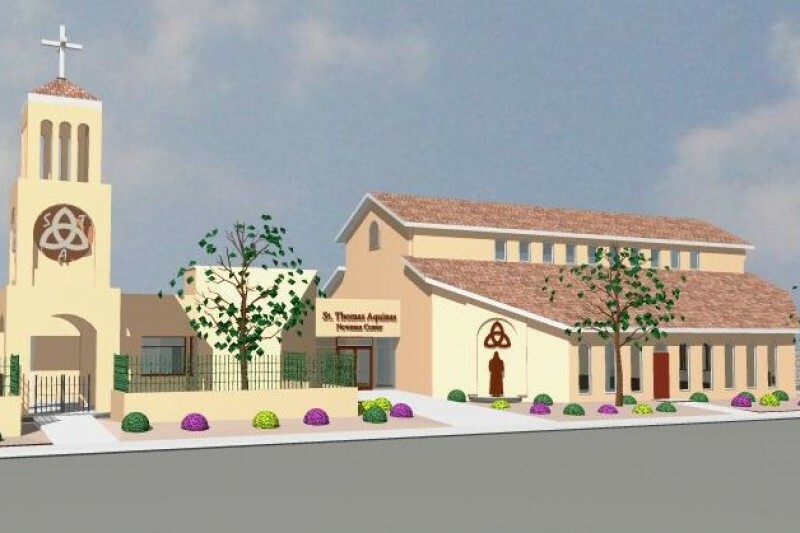 With the Catholic Diocese of Las Vegas still owning the building and the Catholic community being the sole remaining organization, the Interfaith Student Center was renamed the St. Thomas Aquinas Catholic Newman Center. At present, the Newman Center still maintains a presence on the UNLV campus through involvement in Homecoming, Ash Wednesday Mass celebrated in the Student Union, tabling events on the Free Speech walk and the student union plaza, and other activities throughout the year. Since 2005, the Newman Center has helped 117 people receive the Sacrament of Confirmation and Baptized/Received 61 converts into the Catholic Church. In addition, 41 people from our Newman Center have received their First Communion. The current building occupied by the Newman community does not have any characteristics from the outside that would distinguish it as a Catholic space. A number of students that enter the Newman center for the first time do not return because the familiarity of a permanent church setting and sacred space (a cross, stained glass windows, tabernacle, altar, icons, etc.) is not visible. The inside of the center is just as non-descript as the outside: the worship area is set up to look like a chapel on Sundays and is taken down for student events on weekdays. The multi-purpose space is able to comfortably fit 84 people for Sunday Mass. Despite our publicity efforts through our information tables at the Free Speech walk and student union plaza, advertisements in the UNLV newspaper, and our physical presence, we still experience difficulty in attracting students to the Newman Center. We came to the conclusion that our current space is inadequate to effectively attract and accommodate a significant number of the Catholic students on campus. • Wanting a place to worship at Sunday and Daily Mass. Our plan is to construct a $2.5 million, 340-seat, 5,000 square foot church addition to our current building. This plan has been whole-heartedly approved by Bishop Joseph Pepe of the Catholic Diocese of Las Vegas. We are coming along in our fundraising efforts through the generosity of our wonderful donors and have so far raised over $1,429,822! We are more than half-way to our goal! We are on our way to making this dream a reality, but we still need your help in the form of time, prayers, and financial gifts. If you would like to visit us, we are located at 4765 Brussels Street, Las Vegas, NV 89119. This church will make a difference in the lives of Catholic students at UNLV by providing them a spiritual home in these formative years of their lives. It will also be a place for both Catholics and non-Catholics alike that are curious about the Catholic faith or who are looking for a place on campus to pray, meditate, or get away from the craziness of college life (if only for a moment) to find refuge.